With the ability to detect body heat, fly through uninhabitable areas, and instantly transmit high-definition video, photo, and audio across the globe — without putting service members at risk — drones have cemented themselves as part of the next generation of military warfare. But drone technology isn’t just useful when it comes to spotting targets and surveilling large swaths of land. The U.S. Navy recently announced its plans to purchase 10 new warships between now and 2024 — none of which are scheduled to carry a single sailor. Instead, these drone ships will haul sensors and weapons, extending the defensive range of fleets already at sea. The Navy plans for its drone ships to measure up to a football field in length, providing ample storage for high-tech sensors and weapons. These sensors can significantly extend a fleet’s current sensor range, giving commanders the ability to detect and respond to attacks or threats nearly instantaneously. Currently, the earth’s natural curvature makes it tough for even the best sensors to detect a low-to-the-ground attack from a great distance. While satellites can provide information from literally the other side of the globe, when it comes to anticipating and avoiding surface airstrikes, naval fleets can be at a major disadvantage. But unmanned ships can go farther than manned ones, helping fleets see and avoid attacks much sooner. Because these ships have no crew, they’re not required to maintain food and fresh water, periodically dock to allow service members to go on leave or attend to an emergency, or provide for other needs that are uniquely human. And since these drone ships and their valuable high-tech cargo are likely to be prime targets of enemy forces, the fact that no service members will ever be on board while these ships are at sea can further ensure soldiers’ safety. 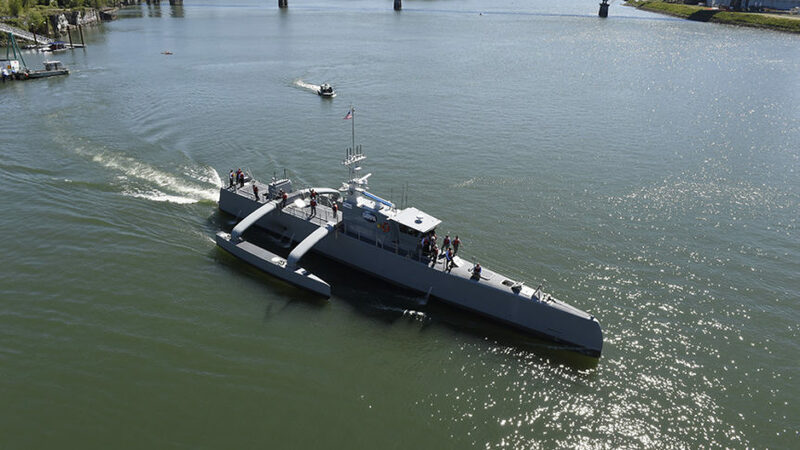 The Navy will begin this drone ship rollout by purchasing two large surface vessels, both between 200 and 300 feet in length. This pair, deemed the “Ghost Fleet,” will sail ahead of the rest of the naval fleet to detect any airborne or seabound threats. If a threat is detected, the drone ship will immediately alert its armed escorts, which will be capable of deploying missiles with a range of 100 miles or more. After the Ghost Fleet has performed its test missions and any unforeseen problems or issues are addressed, the Navy will begin adding to its drone ship arsenal, increasing cargo capabilities and augmenting the onboard weaponry. Additionally, the Navy has begun work on a set of eight aerial refueling drones, which will ensure that the Ghost Fleet can operate around the clock.